Over the last four years of my healing journey, I’ve been blessed to meet others who understand how being limited physically can lead to a devastating sense of discouragement, loneliness, grief, and frustration. Not being able to participate in family outings or even commit to events can cause emotional and relational strain. Focusing on what we used to be able to do or how things were before can send us spiraling into depression. We can beat ourselves up with guilt or lash out at others. Daily battles with chronic pain or an extended healing journey can make us feel useless, feel like a burden, or feel forgotten. I’ve experienced all of the above at some point in my personal battle with chronic pain. But, I’ve also learned the secret to finding peace and joy in the midst of physical and emotional chaos is giving in to God’s inexhaustible power. Like the apostle Paul in 2 Corinthians 12:7-8, I’ve pleaded with the Lord to take away the thorn in my flesh. Though Paul doesn’t identify his thorn, mine comes in the form of constant, debilitating pain. I’ve succumbed to melt-downs and begged God to heal me and make me strong again. Though I’ve tolerated inconsiderate comments from those who insist I’d be healed completely if only I had enough faith, the apostle’s testimony breathes encouragement into my weary heart. The Lord didn’t criticize Paul’s admission of weakness, silence his supplication, or relieve him of the thorn in his side. God’s grace is a manifestation of His regenerating favor. His freely-given lovingkindness is plentiful, more than enough to sustain us. Our admission of weakness is a prerequisite to our acceptance of our total dependence on His power, which is magnified when we realize how absolutely helpless we are without Him. While this complex connection can rouse fear in the bravest of warriors, the Holy Spirit fuels our strength when we surrender to our irrefutable need for God. When our reserves are empty, Christ’s power infuses us with resilient faith. We may not be able to explain how, but we can be certain He will bring us through. God doesn’t just give us strength. He is our strength. The Lord doesn’t just provide a sanctuary during our time of need, His constant and powerful presence is our sure stronghold. Whether we’re stricken by physical or emotional turmoil, we can lean into our weaknesses with complete confidence in our loving Father’s ability and willingness to carry us through. 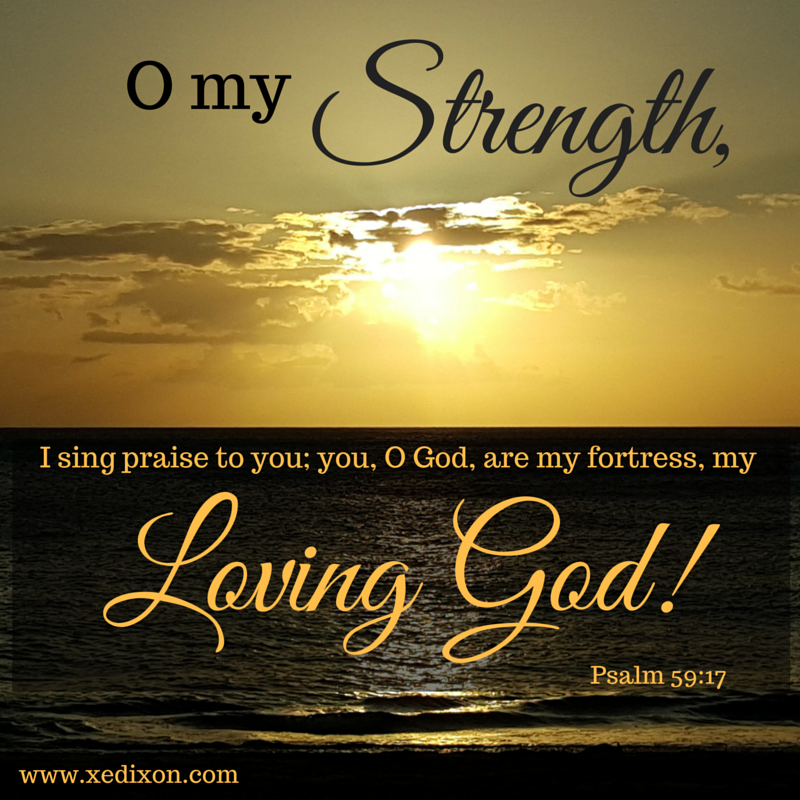 Lord, thank You for being our Strength, our Sustainer, our Stronghold, and our Savior. Please help us accept our great need for You as a gift that prepares us to succumb to Your inexhaustible power. In Jesus’ name, Amen. Photo taken by and meme created by X. E. Dixon. On Monday night, I pleaded for God to take me home and end my affliction. By Tuesday morning, I thanked Him for not saying yes to my desperate cries. As I recuperated from another night of high level pain and nonstop spasms, I rested secure in God’s constant and mighty presence. With my nerve ablation failing, the continual stabbing pain in my upper thoracic back and rib cage has increased. The constant hurting overwhelms me. But when the spasms spread from my upper thoracic back to my trapezius muscles, which happens almost every day, I start begging God to intercede. I know from experience that those spasms can lead to a debilitating tension headache. These headaches last for hours, cause severe nausea, and have occurred almost once a month since 2012. My powerful pain meds or massages don’t alleviate the pain. Ice packs, heating pads, or being slathered in Icy Hot don’t help. All I can do is sob prayers and wait until the muscles stop flaring and the pain subsides. For a few days after an episode, I’m physically, emotionally, and mentally drained. It would be easy to isolate myself and crawl into a ditch of depression. But when doctors first diagnosed my injury and began a treatment plan, God nudged me to invite others to share my journey. Obeying the Lord’s leading to join an interdependent community of believers online has saved my life. As I’ve shared praises and prayer requests on my blog through social media, I witnessed the Lord working in ways I would never have dreamed possible. 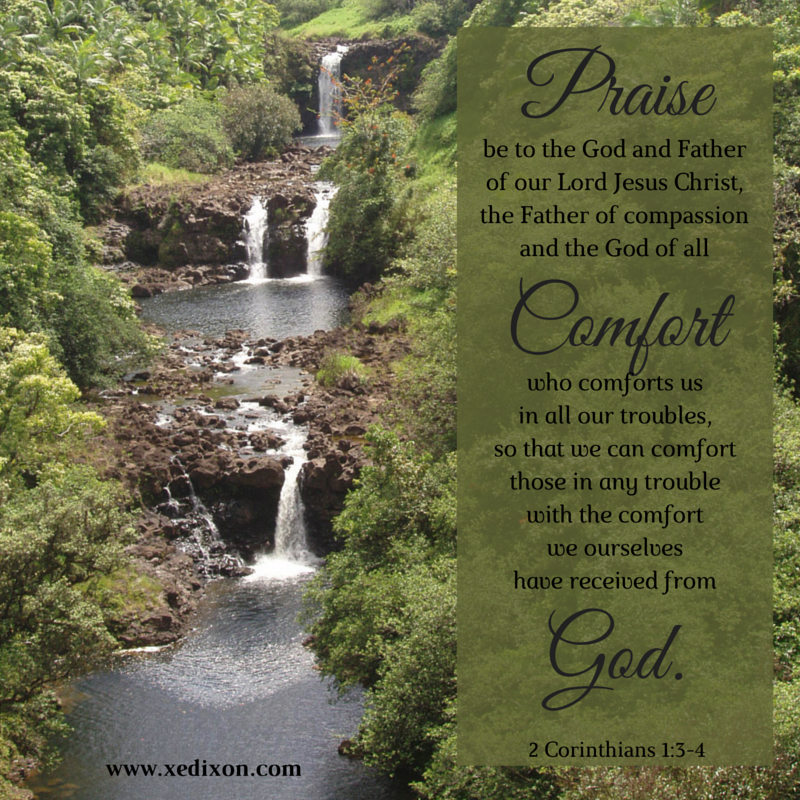 As God comforted me during my pain, He increased my compassion toward other hurting people. As we joined forces online, prayerfully supporting and encouraging one another, others who read our comments joined in. Before I knew it, God blessed me with a community of loving people praying for me along with complete strangers. Friends of mine became friends with one another. Our prayer circle grew and grew and grew. Every time I struggled with pain, my heart ached for others who were hurting. When I could have focused on my seemingly unbearable misery, God helped me share so that others would be encouraged through their moments of despair. Though our circumstances were different, not one of us could escape the impact our physical, emotional, or mental affliction had on us and those around us. Our stories became testimonies of enduring hope, for the hurting and those who knew hurt could be lurking around the corner. Soon, friends began sharing how their faith deepened when they read the transparent posts I shared and the interactions between people in the comment section. Only God could bring about this beautiful ripple effect. The Lord’s power and mercy were magnified as He continued using hurting people to minister to other hurting people. He comforted each individual, then empowered that person to share the comfort He’d given them with others who desperately needed to be comforted. I wish I could take away the pain others have to endure. I wish God would grant me complete healing. But as He continues to carry me through the moments that feel impossible to survive, I can now see how He purposes suffering through a beautiful cycle of Spirit-empowered comfort. Some of the bravest people I’ve met online intercede for me in prayer, even when they’re suffering through their own afflictions. When I witness someone trusting the God of all comfort as He carries them through a tough day, the Holy Spirit strengthens my resolve. If they can depend on His faithfulness, so can I. If they can praise God even whether He decides to heal them or not, so can I. If they can share with transparency and inspire others toward persevering faith, so can I. If they can comfort others with the same comfort they received from the God of all comfort in their most desperate times, so can I. We can do all these things and more because the Holy Spirit helps us trust the God of all comfort, who will never waste a moment of our suffering. Lord, thank You for reminding us that You are with us, comforting us and strengthening us when life on this side of eternity feels impossible to bear. Thank You for every blessing that flows from Your sovereign goodness, even our moments of suffering and affliction. We know You are in control, purposing our pain to magnify Your power and our complete dependence on You. Help us trust in You as we receive Your comfort and, in Your power, comfort others who need a reminder that the troubles of this world will pass. Our hope is in You, Lord. Hallelujah!